Tuesday was Mardi Gras. In France, it’s carnival day, one of the most fun days of the year for kids. While growing up, we always celebrated carnival day. In my small village, all the kids would dress up and meet in the school courtyard. Then we would all walk together through the village, while people would watch us pass by and say hello. Nothing fancy really, but as a kid, I always thought that was so much fun. My sister and I would put a lot of thoughts in creating our costumes. We never bought the already made costumes, we would borrow my parents’ clothes, or anything we could find and get creative. After the “parade”, we would go home for the “goûter.” The goûter is the equivalent of the 4 o’clock snack. Since dinner time is around 7 or 8 pm, French kids have a 4 o’clock snack to keep them going until dinner time. 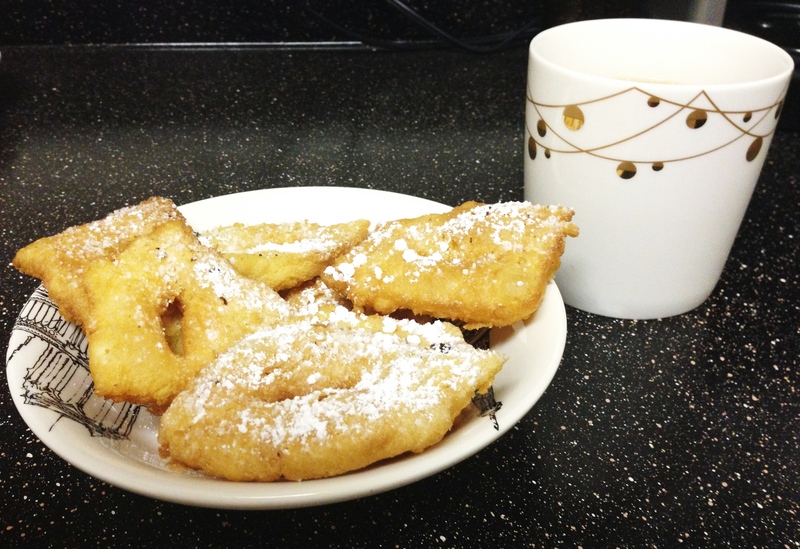 For carnival day, there is of course a special “goûter”: the Beignet de Carnaval. It is so delicious, it’s almost sinful. Good thing I only make those once a year because otherwise, I would be walking around with a few extra pounds! But I promise you, it’s worth it! In a large bowl, mix the melted butter, salt, sugar, vanilla extract and rum flavor. Add the crème fraiche and the eggs. Stir generously. Add flour and baking powder. Stir using your hand. Dough should not stick. Split Dough in 2 balls. Using some flour and a rolling pin, make a 3 to 4 mm thick paste. Cut little triangles or diamonds in the paste (with a cut in the middle of the shape). Meanwhile, heat up oil in a large deep pan. Put beignets in hot oil for a few second on each side (it should be golden, not brown) and transfer to a platter with absorbing paper. 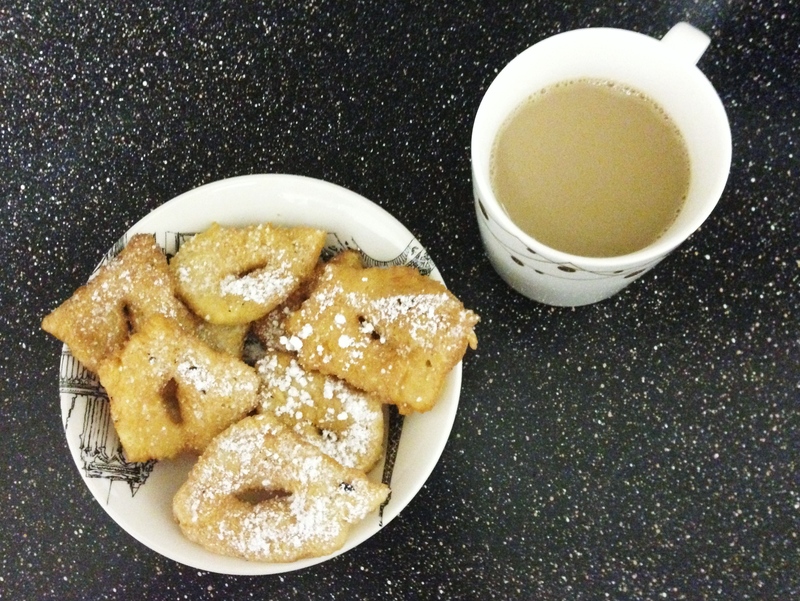 Once all beignets are ready, sprinkle some powdered sugar on top. Serve with a café au lait or hot cocoa! PS: If you have the patience to prepare the dough a day in advance, please do so, it’s even better that way. C’est encore meilleur si on fait la pate la veille!!!! C’est bon a savoir! Il faut juste pouvoir attendre toute une journee avant de les manger. Hey, just nominated you for the Liebster Blog Award. You can check it out my site, monsieuremaman.com. Thanks! Thanks so much! I’m very honored, I’ll make sure to write a post about it this week! I want 3 with cafe au lait! great idea, we’ll have to make some for coffee time one afternoon! I’m going to make these this weekend, they look glorious! looks delicious! i would have that everyday! Yes, they are dangerous that way!